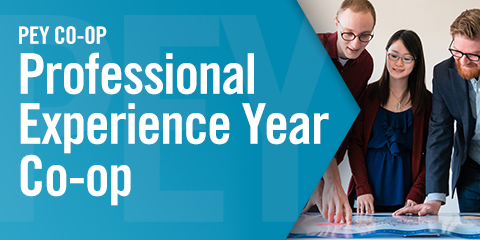 The Professional Experience Year Co-op Program (PEY Co-op) is your opportunity to work full-time for an employer of your choosing for 12 to 16 consecutive months after your second or third year of studies. You will apply your engineering competencies to industry challenges while making meaningful professional contributions. Through PEY Co-op, you can focus on professional development without the need to switch between work and school each semester. The Professional Experience Year Co-op Program is both paid and optional. During your PEY Co-op, you will earn a competitive salary, positioning yourself perfectly to negotiate a higher starting salary after graduation than those without the same quality of experience. You may register for PEY Co-op through the Engineering Career Centre (ECC). There are two registration periods: September and January. Before registering, you should attend a PEY Co-op information session. There is a fee to register for PEY Co-op. After registering, you will attend workshops and career counselling sessions to help you refine your job-search skills and help you identify your career interests. You can apply for as many positions as you like. With 1,500 – 1,800 available positions from over 400 employers worldwide each year, students have a remarkable range of opportunities. Students interview for positions with employers either in person or via Skype. Students often receive more than one job offer. Once you have secured a position, you pay a fee to the ECC. Before your position begins, you will attend a workshop on how to transition into the workplace. During PEY Co-op, the ECC maintains an open dialogue with students and employers to ensure a positive experience for all. Upon completion, students debrief on their experience through evaluations and produce a final paper.